During my interview for the Idaho Birding Blog profile earlier this year, several of the questions involved my favorite birding tools. In addition to the traditional ones such as binocs and books, I mentioned that I was eager to do more with BirdsEye, a new application I had recently installed on my Apple iPhone. As a result, the ever-inquisitive blog publisher and birder Robert Mortensen asked if I'd provide a report on the program for his blog readers, as I became more familiar with BirdsEye. Being a writer by trade, at least as part of my second career, it didn't sound like too difficult a proposition, and given a deadline for the piece, I figured I'd also have a deadline prioritizing some fieldwork involving birds and the new product. So with the mid-May deadline looming over me the last few months, I've had the opportunity to use BirdsEye in a few different situations. For those not exceedingly familiar with the technology area generally referred to as “smartphones” and typified by the Blackberry and more recently the Apple iPhone, these are devices that pack much of the power and capability previously only available on desktop and full size laptop computers into a pocket-sized communications device. As the label “smartphone” implies, these devices trace their roots to basic mobile phones, but smartphone users often find themselves using the other capabilities of the device much more frequently than the phone itself. Smartphones have many built-in, basic functions such as e-mail readers, web browsers, and even mundane features like alarm clocks and calculators, but their power really soars with the addition of customized applications. 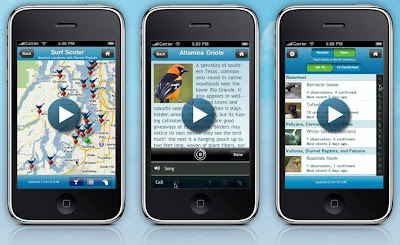 These "apps", as they are more frequently called, run the gamut and literally number in the hundreds of thousands, with a few of that number being bird- and birding-related becoming available for smartphone and especially iPhone users over the last several years. “If you are in search of a particular bird, BirdsEye will show you where it has been observed, and even give you directions. If you are new to birding or an experienced birder who is on the road, BirdsEye will give you a list of birds seen nearby and a map of birding hotspots for any location in North America (the contiguous 48 states, Canada, and Alaska). The application includes images and audio for 470 of the species that are most frequently observed in North America. Additional content is available for more elusive birds—for a total of 847 species." Having been an Apple iPhone owner (and fan) for several years, I was lucky enough to receive the app as a holiday gift (actually since this is software and virtual in nature there was nothing to wrap up for under the tree except a $20 app store gift certificate of a New York Times review of the product), and was excited that one of its primary functions and claims to fame is its access directly into eBird. And while I hadn't been a user of eBird before but rather a somewhat distant admirer of the concept, I figured that the new app would be a great way for me to get more involved. My work with the eBird remains limited, even after my hands-on with BirdsEye. I'm sorry to say I'm not a participation in the “210 for 2010” contest and I'm yet to post my first bird list. But in some field testing in locating birds using BirdsEye and its access to eBird, I do have a better perspective on its power and limitations. For example, a few weeks back, after following the state’s birding activities through my regular IBLE (Idaho Birders Linked Electronically) updates, I went to see what BirdsEye was showing about the decade's biggest bird sighting for the state, the Hooded Crane at Carey. On the other hand, the pocket-field-guide-with sounds has been a boon this Spring, for me. Since this is a review and not a roundup, I am not on the hook to compare BirdsEye with other mobile birding solutions, but its capabilities as a pocket field guide is where I've found where I most appreciate the product. For example, in a very McCabe-ian afternoon bike ride through Boise's North End this week, I was able to pull out the trusty iPhone with its BirdsEye and confirm that, yes, I did still recognize the song of a migrant Chipping Sparrow. No, that wasn't a Yellow Warbler singing, but rather to me anyway scary similar song of the Lazuli Bunting. Like other sound-learning products, its appeal will certainly be seasonal, but for now, I am loving my BirdsEye! I shall have to check this app out and see if it can be used with a Droid, as that is what I have. Thanks for the review of BirdsEye! I've been part of the development team at BirdsInTheHand.com. As a birder, former member of the National Audubon board, former VP for Science at National Audubon, former director of VIREO at ANSP, lapsed ornithologist who spend a lot of time studying shorebirds, it's been so much fun to get back into this line of work and collaborate with people like Kenn Kaufman, John Fitzpatrick, Susan Drennan, and others, many of whom I hadn't seen or spoken with for almost 2 decades. We appreciate the positive review! Field testing BirdsEye has been a real eye-opener about the value of eBird. I've seen more life birds in the last 5 months than I had seen in the last 10 years, because BirdsEye made it much easier for me to integrate efficient (and fun) birding into my business travel. It helps you find birds you haven't seen and to find great places to bird that are known to local experts, but not to temporary visitors. A few comments about the review. Several months ago we eliminated the need to purchase additional species, so all 847 come with the first purchase. That was a free upgrade. We also added a nifty way to track rare species and notable observations, using eBird data. One of the things you learn by using BirdsEye is that while birders some parts of the country have fully embraced eBird, others lag. We hope that the simple and elegant user interface that BirdsEye provides will be incentive for a lot more birders to join eBird and make their observations available to a large public. We will be releasing some new upgrades over the next several months, including an amazing way to view migration (first) and the ability to add observations to eBird directly from BirdsEye (second). Both upgrades will be free. Pay attention to the notice you get from the iTunes app store about the availability of upgrades! If you visit the BirdsEye website GetBirdsEye.com you'll see we are very careful to make it clear we aren't trying to compete with bird ID guides, either books or apps. Instead, BirdsEye is a bird-finding app... like no other. The 'floor wax or dessert topping' comment appears to have missed that. Sorry if we haven't been absolutely clear on our goal and focus. You're absolutely right about the Hooded Crow. We used our advisors Kenn Kaufman, Susan Drennan and the eBird team to identify the set of birds to cover. Their recommended list of 847 includes all species that are regular (even if very rare) birds in North America. I was excited, if a bit apprehensive, upon discovering a comment from last Wednesday's guest post at the Idaho Birding Blog. As the topic of the post was a hands-on review of iPhone app BirdsEye, and the comment was from Pete Myers from BirdsEye, I was a bit apprehensive before reading, with a little voice in my head reminding me of all the things I might have been incorrect about and put out there, nonetheless, for all the world to see. However Pete's comments started out on the upbeat, thanking me for the positive review, and then goes on (as you can read, above) adding a few clarifications. So thanks Pete, for taking the time to add insights with your comment. And you've made me vow to take a couple of steps, fun things that I've been meaning to do anyway. First, I realized (in doing the review, but especially following your comment) that to get the most out of BirdsEye I can't just be a "taker" from the database, so therefore I will become an active eBird participant, and in fact just input my first ever eBird list this morning. Second, as I admitted in the review that it was not a roundup of bird-related iPhone apps but rather a specific review of Birdseye, I decided I really need to do that roundup, starting by downloading I bird and using it in the field today. Robert Mortensen, publisher of the Idaho Birding Blog, has agreed to let me make that my next guest blog post in the latter part of June. So thanks Robert and Pete, for the platform and guidance!